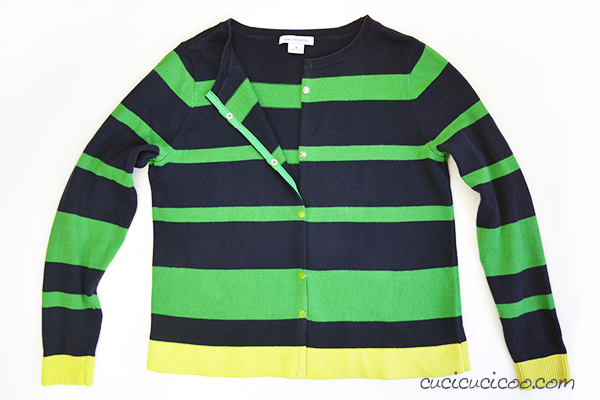 Home Sewing (all) Clothing Tutorial: Refashion a sweater into a cardigan in 10 minutes! I really love cotton sweaters. I do some knitting, so I should love wool like most knitters do, but I just love the way a cotton sweater feels (that is, not itchy), and also how much easier it is to wash them (that is, toss it in the washing machine on a gentle cycle with no fear of accidentally felting it). So when I found this cotton sweater at a thrift shop a couple of years ago, I grabbed it up for just a couple of dollars, despite the size M tag on it (I wear L). And I of course never wore it once because, despite fitting my arms perfectly, it was a tad shorter than I like wearing my sweaters. And it sat in my bureau for two years until I remembered something. That something is that, even more than cotton sweaters, I love cotton cardigans. 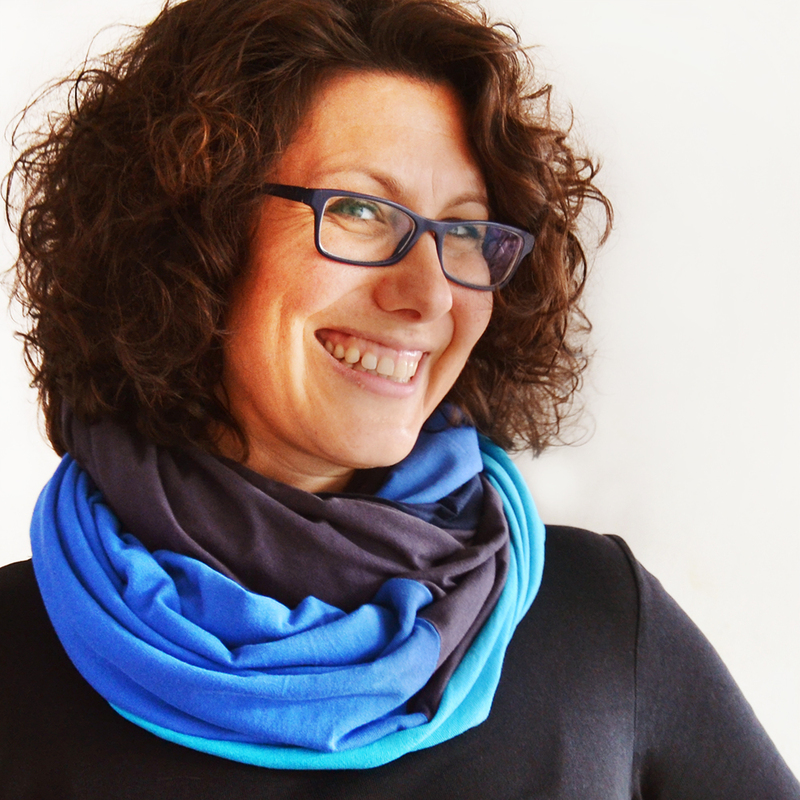 I love being able to wear them open or closed, and how easy it is to layer clothing with them in in-between seasons, or even to toss in your bag when you go out on cooler summer nights. 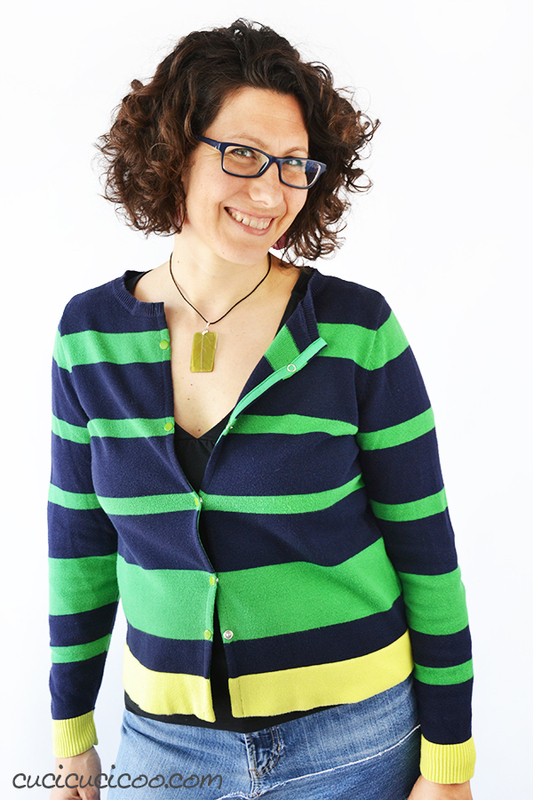 As far as I’m concerned, the knit cotton cardigan is the perfect spring garment. So I turned that sweater into a cardigan in about 10 minutes. And I’ve been wearing it pretty much constantly since then. 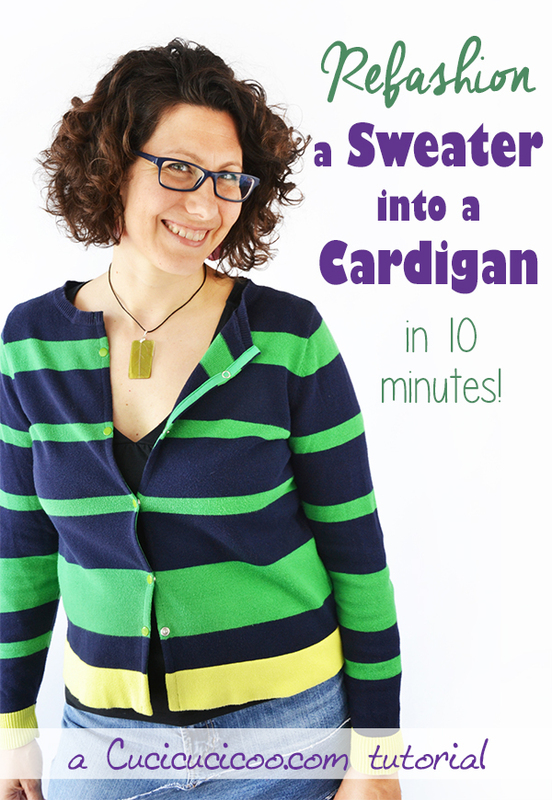 The great news is that it’s ridiculously fast and easy to refashion a sweater into a cardigan! You can leave it open or add on snaps or buttons to keep it closed. (This will take you more than 10 minutes, obviously.) And you will be rewarded with an incredibly versatile garment that you will want to wear every day! 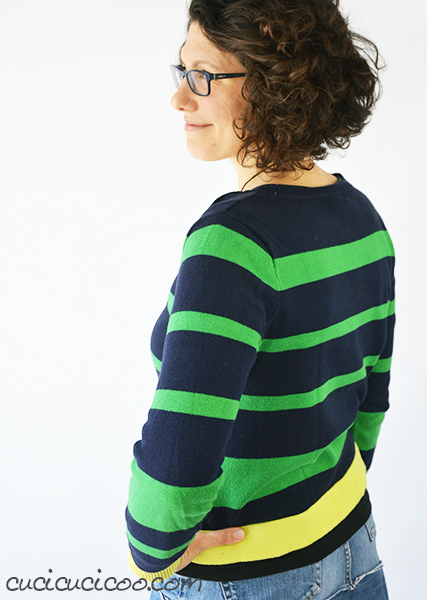 Do you also have an unused sweater (or jumper for you British English speakers) in your closet that you don’t wear? Well then, turn it into a cardigan! Let’s get started! 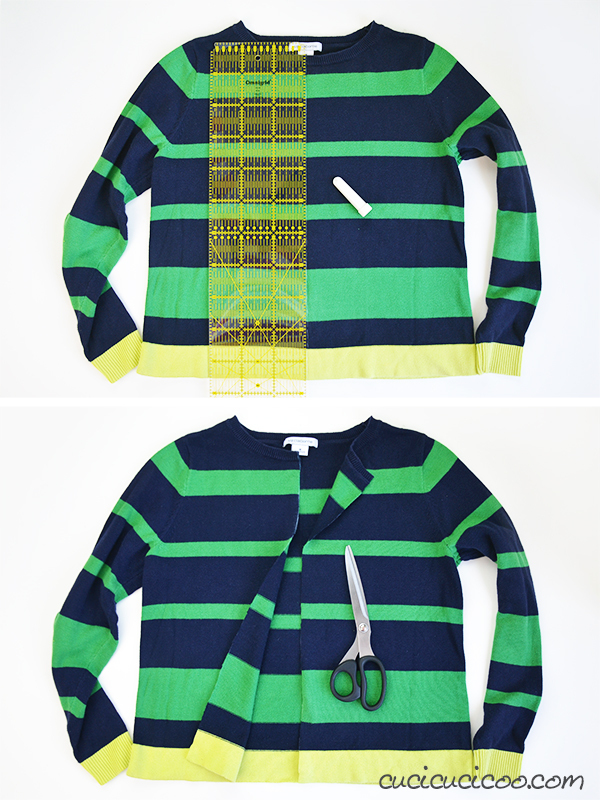 You will need a length of bias tape about 8 cm (3″) longer than twice the height of your sweater. It doesn’t matter what width it is. I used 12 mm (1/2″) single fold bias tape, but you can use one that’s a different width, depending on the look you’re going for. You can buy bias tape in a fabric shop, but making your own is really easy and that way you have more choice as to fabric type and color/print. 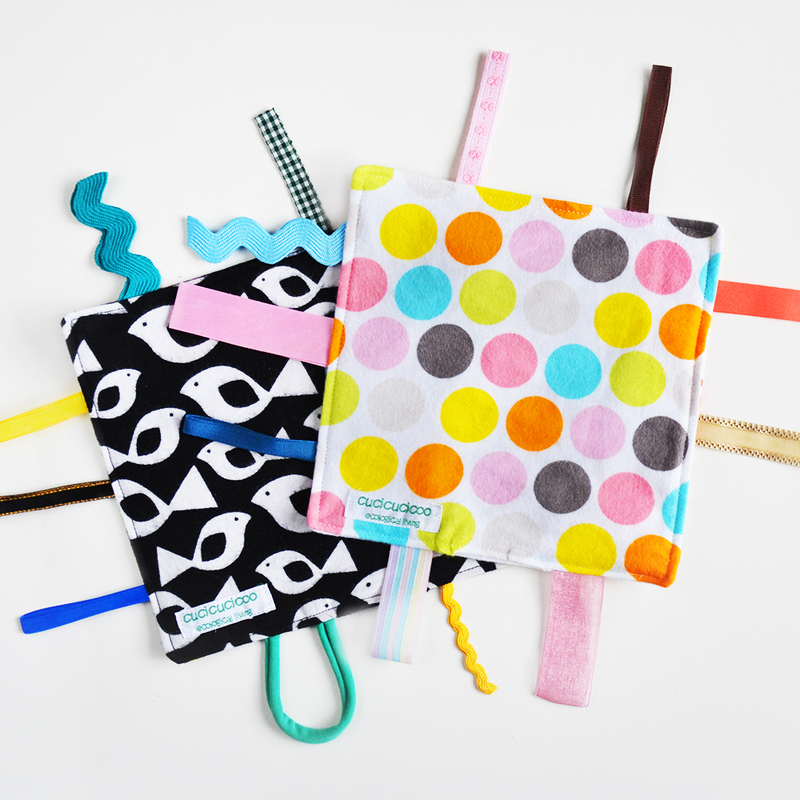 If you don’t know how, read this tutorial on how to make your own bias tape with a bias tape maker. If you don’t have a bias tape maker, I highly suggest you purchase a set of them in different sizes, such as this great 5-size bias tape maker set by Clover*. I wind my finished bias tape on a squashed toilet paper tube. It’s not pretty, but it does the job perfectly! 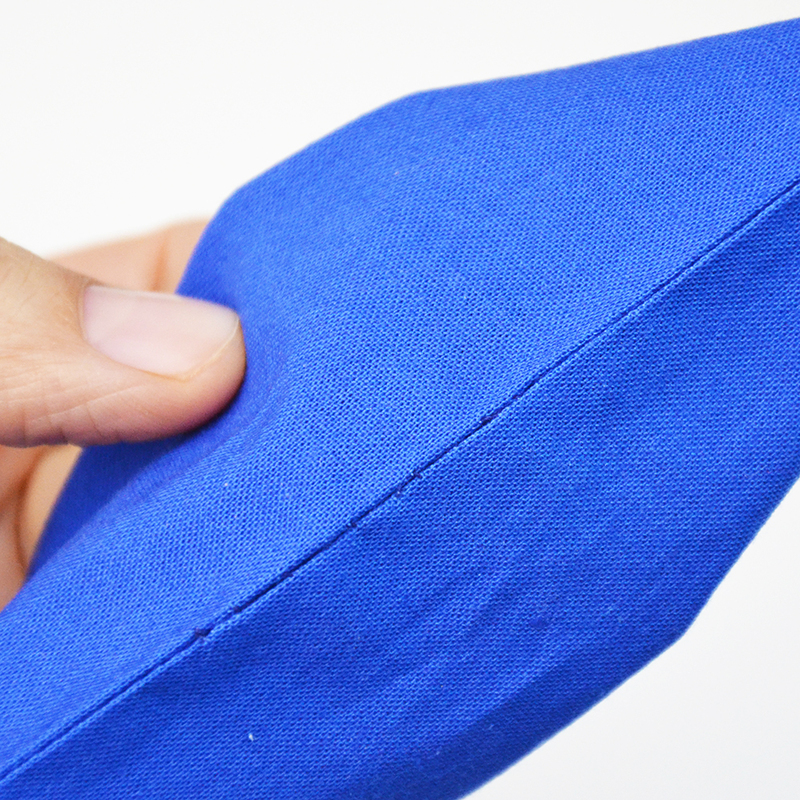 Ok, now set the timer, because if you have experience sewing single fold bias tape, you’ll probably be able to do the following steps in 10 minutes! 1. 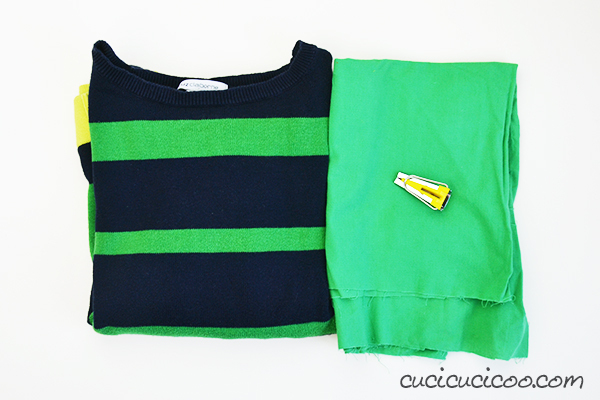 Use your ruler and chalk roller* to mark a line straight down the center front of your sweater. 2. Cut straight along that line. Please be careful not to cut the back layer! *Note* If your sweater’s stitches are knit relatively loosely, and not tightly as mine were, I highly suggest you sew two lines of stitching, one on either side of the center marked line, very close to it, BEFORE cutting. 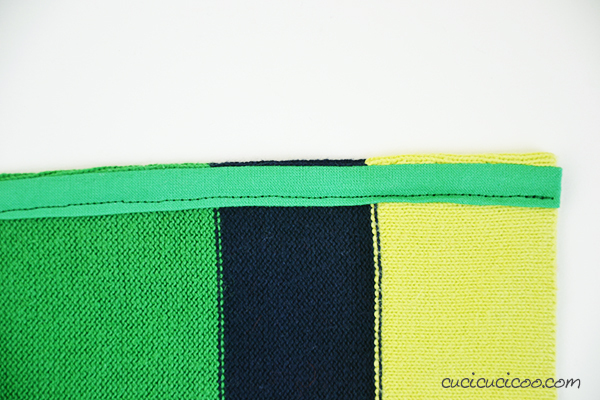 In this way the knit fabric will not unravel when you cut it. Basically, what we are going to do is hem the cut edges with bias tape. 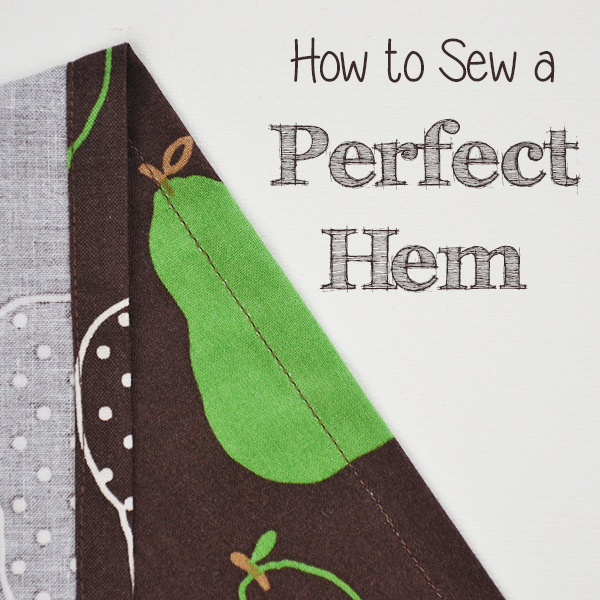 If you’ve never done this, I suggest you read my tutorial on how to hem with single fold bias tape before starting this project. 3. Pin the unfolded bias tape along one cut edge, right sides facing. 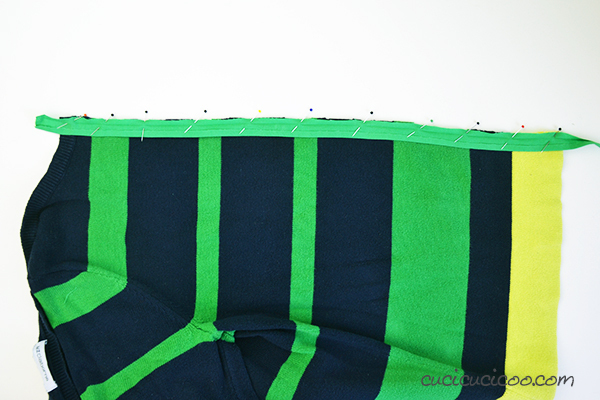 Remember to leave about 2 cm (3/4″) extra bias tape at each end. Repeat along the other cut edge. 4. 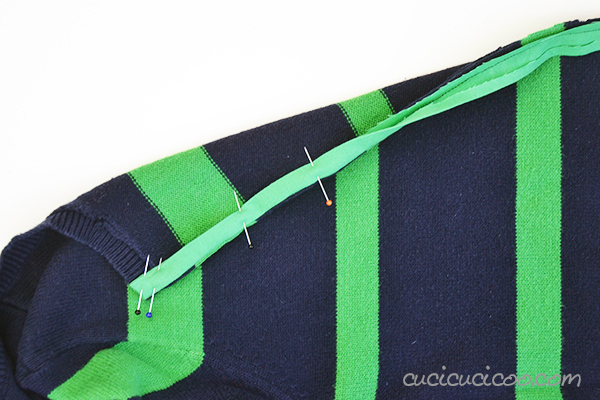 Fold the extra bits of bias tape hanging off each edge to the wrong side of the sweater and pin in place. This may look weird now, but trust me, it’ll all come together. Repeat for all four of the bias tape ends. 5. 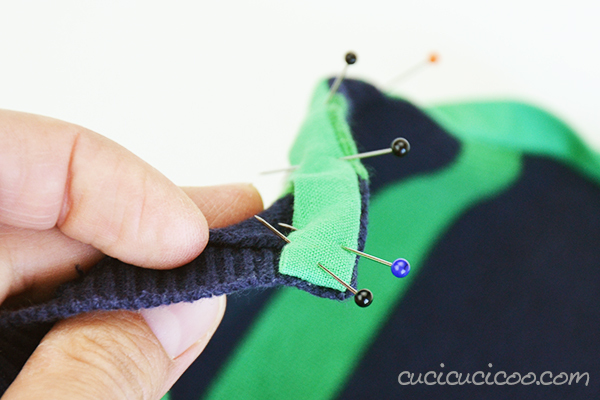 Sew along the fold of the bias tape with your size 100 ballpoint sewing machine needle* (to avoid damaging the knit fabric), making sure that you catch the bits folded to the back. Remember to backstitch at the beginning and end. 6. 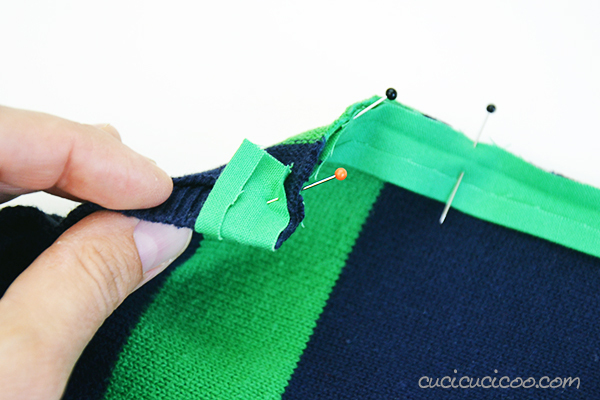 Flip the bias tape to the wrong side of the garment and pin in place. I prefer to fold the fabric over so that there’s just a couple of millimeters of sweater fabric showing between the bias tape edge and the fold in the sweater, that way the bias tape is completely hidden from the front and not visible on the edge. However this is totally up to you. 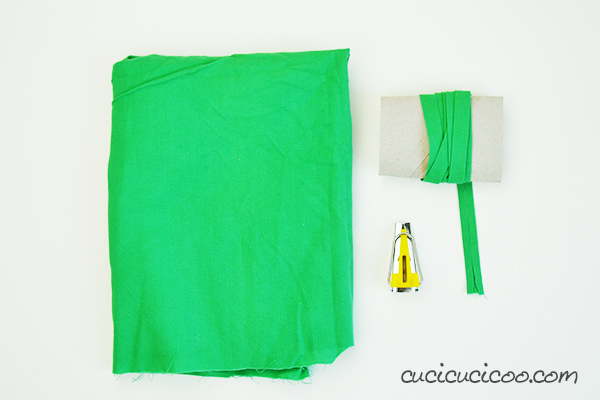 See how the bias tape flips over and covers the ends of bias tape that we’d folded over to the back in step #4? 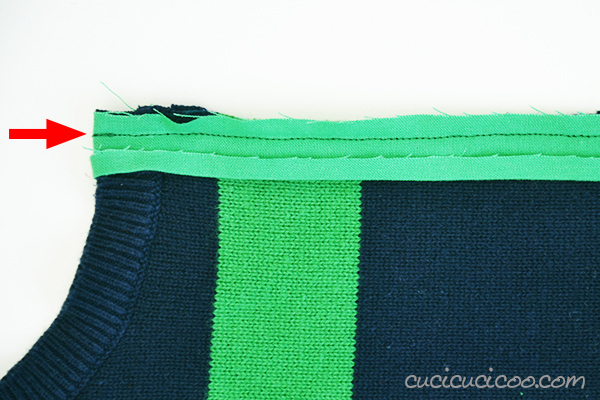 Make sure that you poke the corner of the bias tape out from inside the fold so that it makes a nice crisp corner. You also might want to fold the edge of the bias tape end under a bit so that it’s totally covered up. 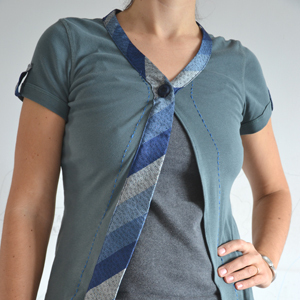 You can leave the cardigan open, close it with a pin, or add on snaps or buttons to keep the front closed. I chose to use my snap press with colored caps matching the green stripes, which is why they are not placed at regular intervals along the front. The bias tape also works as stabilizer for snaps and buttonholes! If you choose to use a snap press or pliers, I suggest you first test it out on a scrap of similar fabrics to make sure that the snaps can handle the thickness of the various layers of fabric. 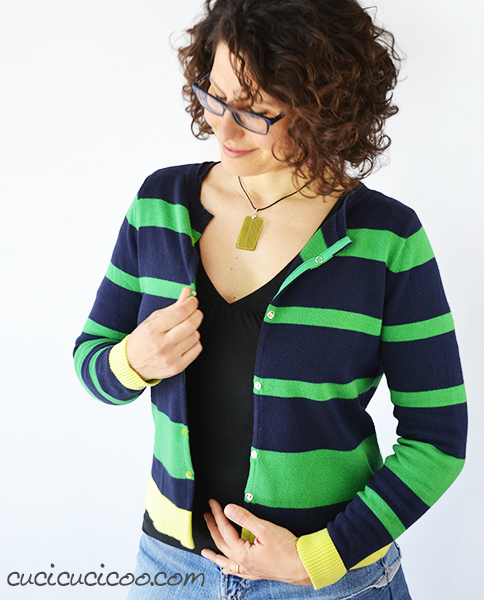 Now try on your fantastic new cardigan and play with all the ways you can layer it! It’s incredible what a difference such a small modification can make! 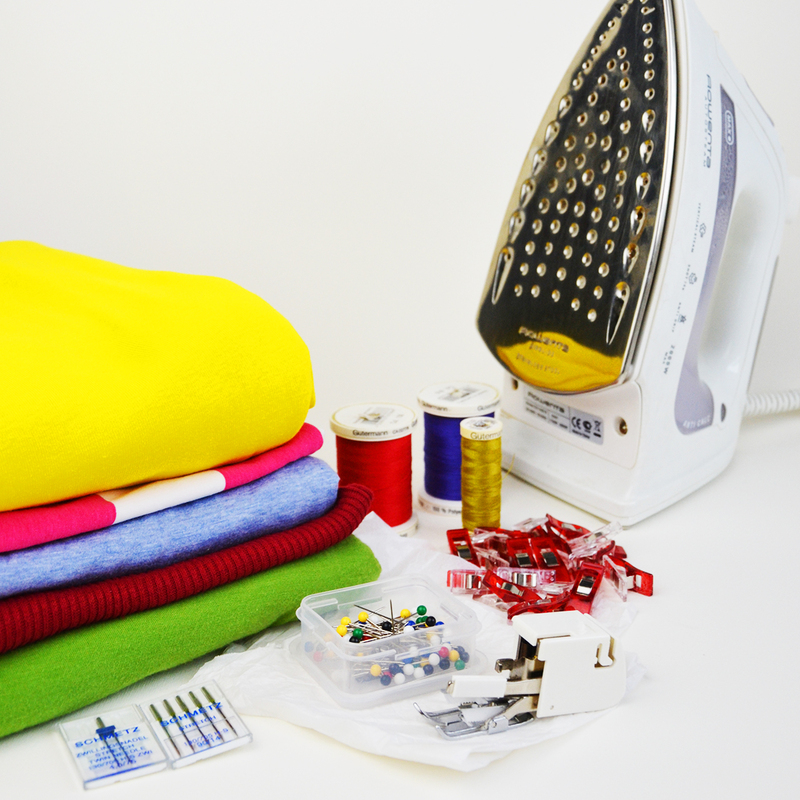 Not only in how a garment looks, but how useful it is! Now that it’s an easier garment to layer over other clothes, it doesn’t matter that it’s a little short on me and I’ve been wearing it many times per week! Hooray! 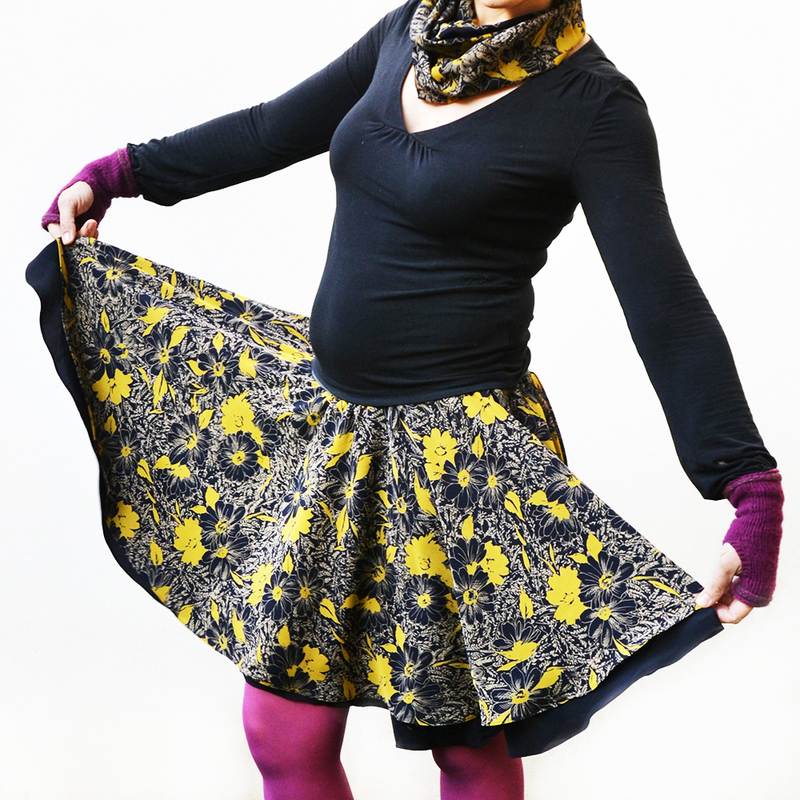 By the way, did you notice the skirt I’m wearing? It’s another really cool refashion, a fresh and modern take on the classic jean skirt! Stay tuned because the tutorial will be coming soon! 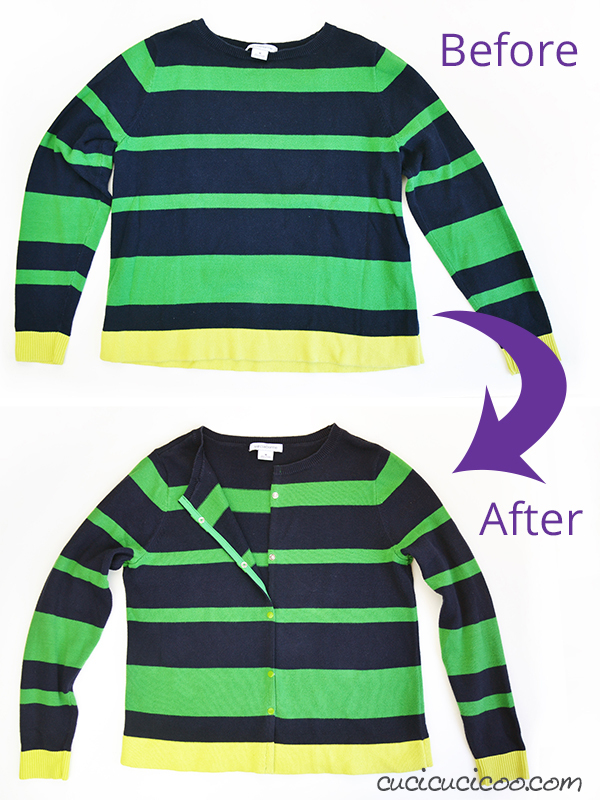 If you loved this tutorial on how to refashion a sweater into a cardigan, make sure you check out this awesome summer cardigan made from a long-sleeve t-shirt and a neck tie! And of course, don’t forget to Pin It! Wow! you are so talented, this is a fantastic idea! I am definitely going to try this out. Definitely try it out, Nuria! It’s one of the easiest refashions possible, and so useful! Bellissimo questo tutorial, molto utile. ti ringrazio. May I make a suggestion? Try sewing before cutting. 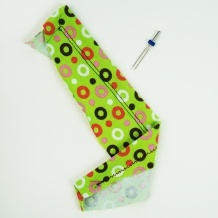 Either sew two close lines to stabilize the fabric and then cut in the middle. 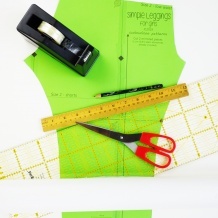 Or if you are lazy and adventurous, pin both biastapes in place, sew them first and only then cut the sweater. Then continue with step 6. What a great way to change up the sweater. It looks terrific. Thanks for sharing at Snickerdoodle. Pinning. Looks great on you, Lisa!!! I love green and navy together. 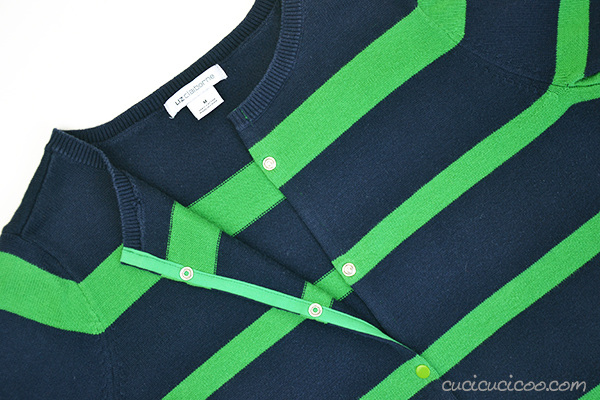 I don’t think I’d ever really considered the green/navy combo before, but I like it too! I just love anything green, so that makes me happy no matter what it’s mixed with! Thanks for stopping by, Pam! 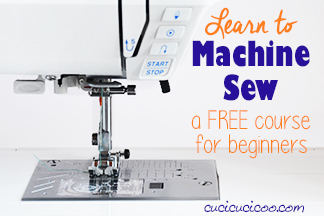 I love your blog, im new to sewing and i have been following your sewing lessons, they are clear and easy to follow. I will have a go at this, maybe use a old sweater though ha so thank you. That’s wonderful to hear, Julie! Yeah, it’s probably better to start your experience with refashioning with old clothing. Making that first cut into a garment can be traumatic! Let me know if you try it! Fab tutorial! Also, did you know you can buy ready made tape with snaps/poppers already incorporated? Yes! I do have some of that tape, but it was in a totally wrong color, so I didn’t use it. But you’re right, that it would be perfect for a project like this! Thanks for the input, Liz! Thanks for the great tutorial I can’t wait to try it! 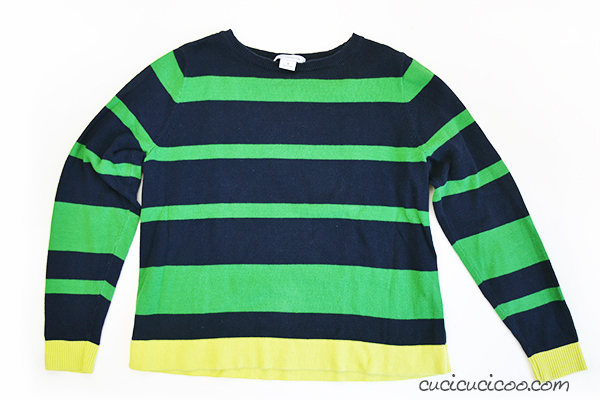 Are you using a knit bias tape or woven bias tape for the sweater project? 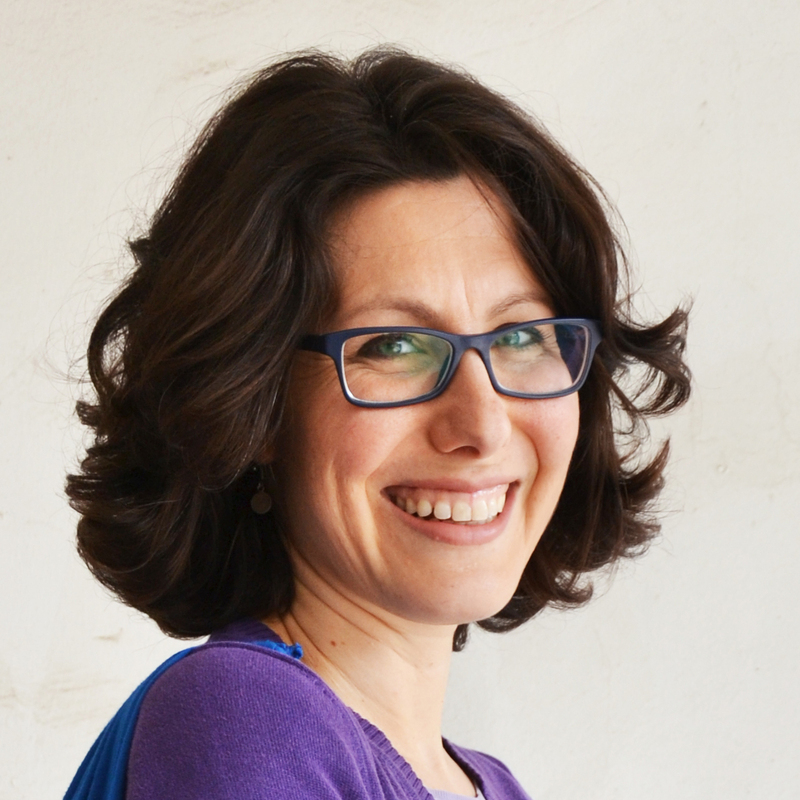 Quale pressa usi per applicare i bottoni? 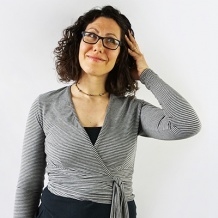 Ciao Daniela, è un’ottima domanda, ma non semplicissima la risposta. Uso una pressa industriale, grande e pesantissimo che mi ha costato non poco, anche per spedirla in Italia, da The Snap Store. Poi ho visto ora che il sito è per il momento chiuso. Ho sempre consigliato un set di pinza e bottoncini di KAM, che è la marca più usata per gli automatici. Purtroppo neanche quello è più disponibile. Se guardi su Amazon, ci sono tantissime possibilità. Questo kit di pressa ed automatici mi sembra interessante, ma non l’ho usato io, quindi non è una promessa! In bocca al lupo!